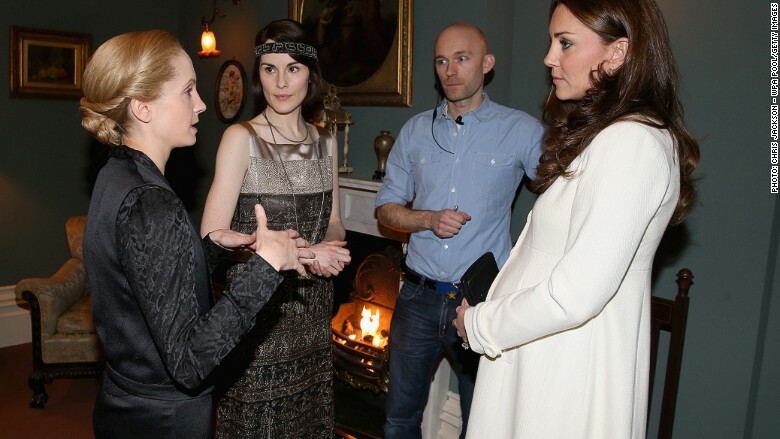 Kate Middleton visited the Downton Abbey cast and crew on Thursday at its London studios. A true royal has visited the set of Downton Abbey. Catherine, the Duchess of Cambridge, met with the stars of the popular British television show during a tour of the London set on Thursday. During the visit, show writer Julian Fellowes said Catherine was the reason the period drama had taken off overseas "after she unwittingly plugged the show during a visit to the U.S. in 2011," according to a statement on the Royal Family's website. Middleton got a taste of life "below stairs" in the servants' quarters and also watched the crew film a scene in Lady Mary Crawley's bedroom. After the filming, the Duchess had an official photograph taken with the cast members in the Servants Hall. The popular English 1920s melodrama is currently filming its sixth season. The fifth season started showing in the U.S. in January. The show is considered one of the U.K.'s most successful cultural exports and is broadcast around the world. It remains the highest-rated drama in PBS history in the U.S. and has won numerous awards, including three Golden Globes and 11 Emmys.